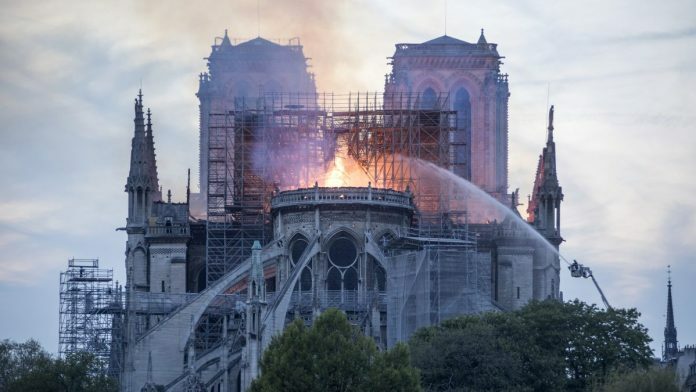 Notre Dame, which captured French monarchy and stood over dark events and many celebrations, including during World War II may now also become an unpleasant symbol of current events like politics of anger. The 850-year-old Notre Dame cathedral in Paris, which took over 300 years to complete, was such a constant in so many lives, including my own. Now the unthinkable has happened: A fire has reduced the icon to ashes and blackened walls. And with that go many of its treasures, historical firsts and deep associations. Notre Dame featured in so many ways in my life as a teenager in Paris. It was a destination many, many times when I accompanied visiting friends and family. I would also ride my moped by it on my way to see my best friend from school, who lived on the neighboring Ile Saint-Louis. Given what it has seen in France’s rich and varied history, it played a central role in many of my French literature and history classes. As I grew up, Notre Dame continued to feature vividly in my life. It was a must see on every visit to Paris. It is a touchstone I have shared with my daughter throughout her life, to this day. Multiply my experiences and feelings by an enormous, untold number, and you’ll still fall far short of what Notre Dame means for current generations in France and around the world, let alone all the prior ones during its 1,000-year-plus existence. Its partial destruction on Monday already feels like one of those events about which you will always remember where you were when you first heard the tragic news, and when you first saw the terrible photos and video. The widespread immediate feeling of shock and sadness is likely to soon give way to a very public and ugly blame game. How could such a jewel be exposed to such risk? Where was the damage containment plan? Why weren’t immediate attempts to quash the fires with water from below accompanied quickly by water drops from above by aircraft? And so many more questions as the unthinkable sinks in. The heartbreaking news comes at a time when France has been rocked by the Yellow Vest movement as part of a much broader global backlash against an establishment that is viewed as less trustworthy, less sensitive and less effective – and this just as French President Emmanuel Macron was set to announce the outcome of “le Grand Debat” with citizens throughout the country. Notre Dame stood for so much before Monday’s fire damaged it. It captured the many ups and downs of the French monarchy and, ultimately, its fall. It was a witness to the not-always-easy evolution of the French Republic. It stood over dark events and many celebrations, including during World War II and its aftermath. And yet, in addition to all the rich personal and national history it will continue to embody for so many, Notre Dame Cathedral may now also become an unpleasant symbol of current events – of popular frustration, the politics of anger and a gaping lack of trust in the establishment.